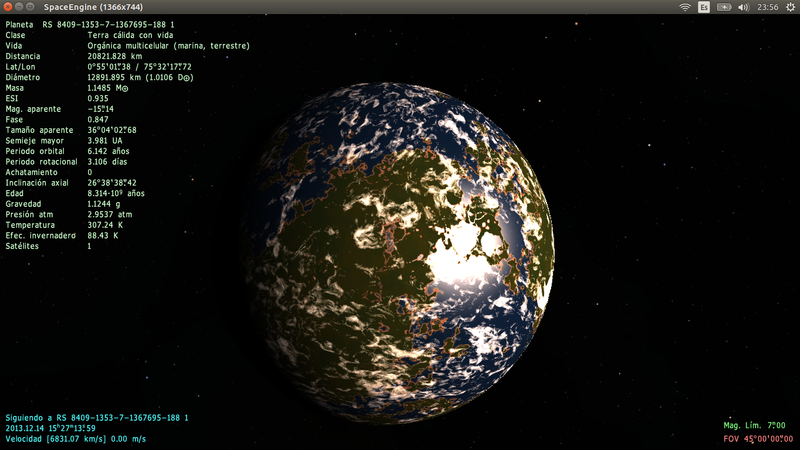 First of all thanks for your tremendous effort to make Space Engine like it is now, I hope that you will get enough funds to make it even better. 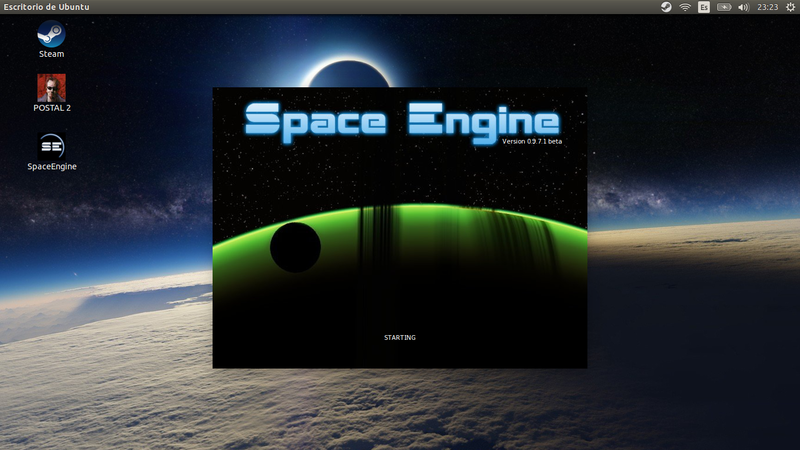 Secondly, I'm new in here so I might have missed it but on this page http://en.spaceengine.org/index/funding_and_donations/0-26 Linux native support is checked and marked in green, so unless I'm mistaking it means that there is native Linux support but on download page I cannot seem to find it, there are only mirrors which point to exe file, so is there really native Linux support and if yes where can I download it from? No, it means that there will be Linux support, not that there already is. You can probably expect it to be developed in the relatively near future. Ok then, I guess I'm going to try to run it with Wine until linux version is completed, although another layer of virtualization will have impact on overall performance (that is, if it runs fine on Wine in the first place). Thanks. milaks, if you read the donation page, it clearly says at the bottom that met funding goals != implemented features. Nor would that make any sense. If someone gave SpaceEngineer a million dollars right now, could he instantaneously release a full SE game? Of course not. Concerning Wine, it should run on it just fine. I've run it on Wine with 0 issues and good performance on Mint 17 and 17.1. Also, please read the forum rules. There was no need to make a new thread for this. 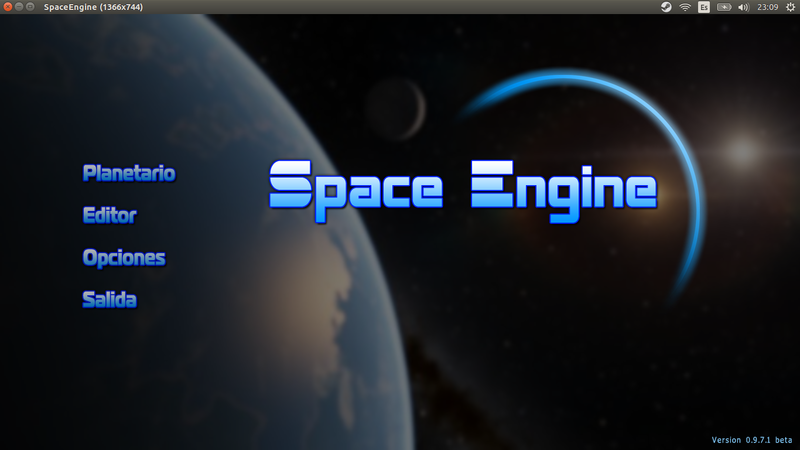 harbinger, I didn't know _when_ was "Linux native support" line marked as "green checked", so if someone gave 3 millions of euros to a SpaceEngineer, year(s) ago then it would have matter. My bad on the other side is that I didn't read the donation page. Nice to hear that it runs fine on Wine on Mint, as I'm running 17.1 Rebecca. Will try tonight, hopefully i5 with 8 GB or RAM and GTX 750 would be sufficient to run S.E. smoothly. BTW did you use "PlayOnLinux" to install S.E. 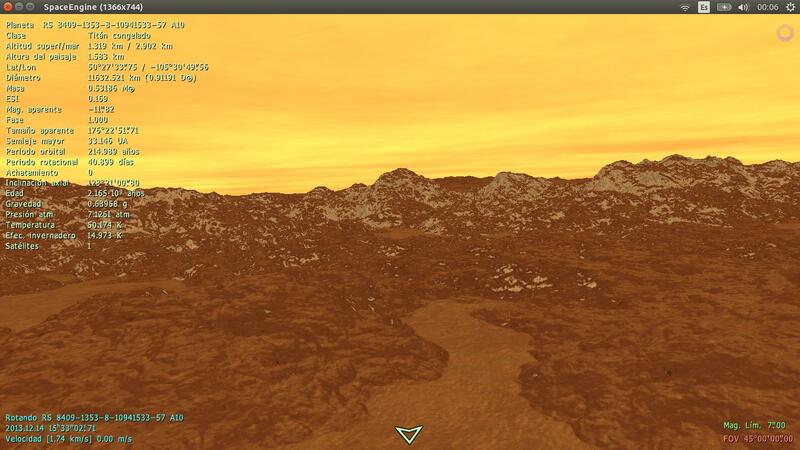 or just plain Wine interface, that is, was there any special tweaking for installing S.E. ? About making a new thread, sorry for that, will be more careful as to not clutter the forum. harbinger, I didn't know _when_ was "Linux native support" line marked as "green checked"
BTW did you use "PlayOnLinux" to install S.E. 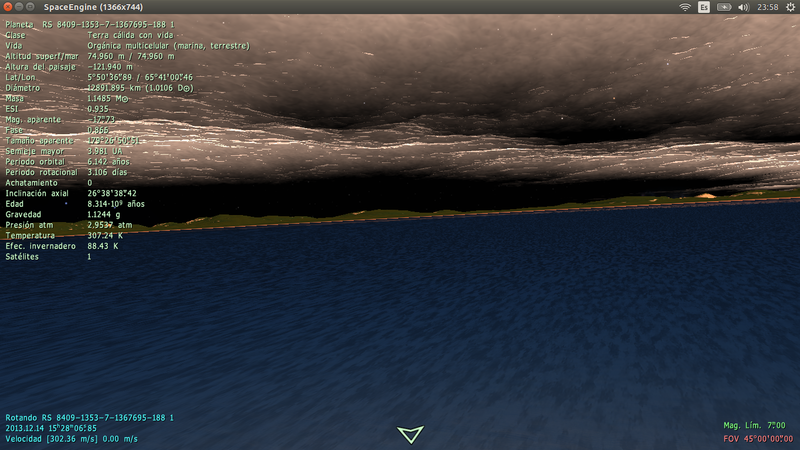 or just plain Wine interface, that is, was there any special tweaking for installing S.E. ? No, I didn't use PlayOnLinux or do anything special. 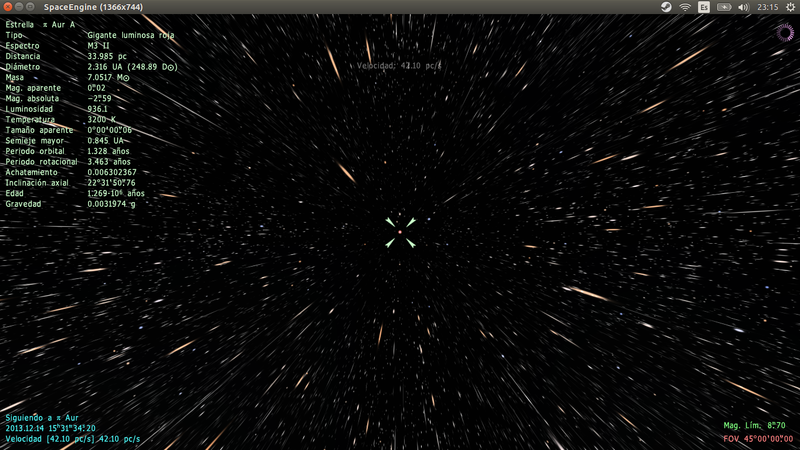 I can add that .973 also seems to run fine for me with Wine on Ubuntu 14.04 without special modifications. In fact, I've never run SE on anything but Linux. I wanted to create a thread but I can't. 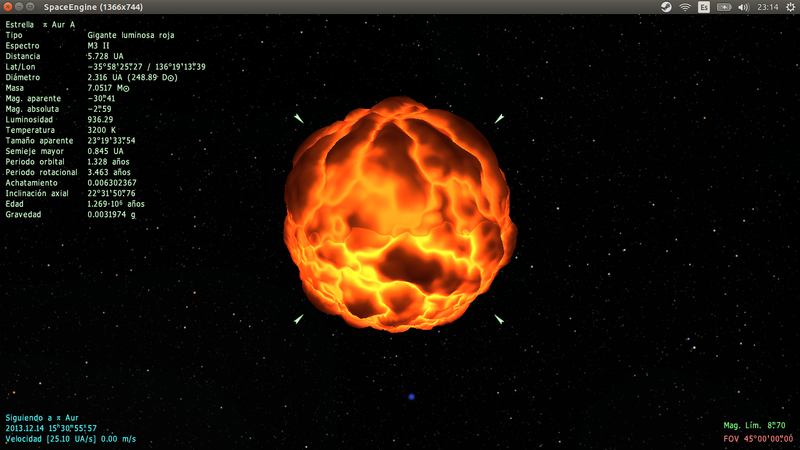 It was going to be called "How to get Space Engine working in Ubuntu"
- Make sure your drivers are updated. This is incredibly important. There are two main ways of doing this. 1- Just keeping your system updated. Most drivers are just included in the Linux Kernel. Current Kernel version is 4.5, updating to it is highly recommended especially if your graphic card is AMD or NVIDIA, huge improvements have been done. If you don't know how to update your kernel, read this. 2- You might need a privative driver to make your graphic card work well. The main drivers in the kernel might work for you, so keep this one just in case it doesn't works. This is easy to make, just search "drivers" in the Ubuntu's menu and you'll see "privative drivers", or something similar in your language will appear. Click it and it will say if there are privative drivers for your card. If there are, click it and install them, then reboot. Important: before updating your kernel or your driver, make sure you have a backup just in case, if something goes wrong you can start up your system with the old kernel by going two times down in the grub (start screen) and select the older version. Then uninstall the newer kernel. 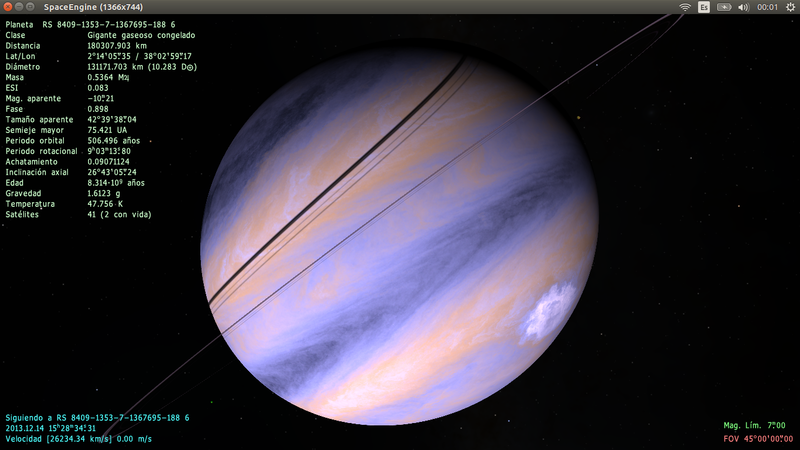 Space Engine is a windows program. So we need a tool that integrates Windows executables in our OS. This is called "Wine". I highly recommend you to install the last developement version, since the integration is excellent. There are no changes in perfomance using this one, that's amazing considering that older versions made programs run slower. 1- Installing the last developement version. You have an easy tutorial here. 2- Installing the stable version from Ubuntu's software center. Just click in the software center and type "wine", then install it. 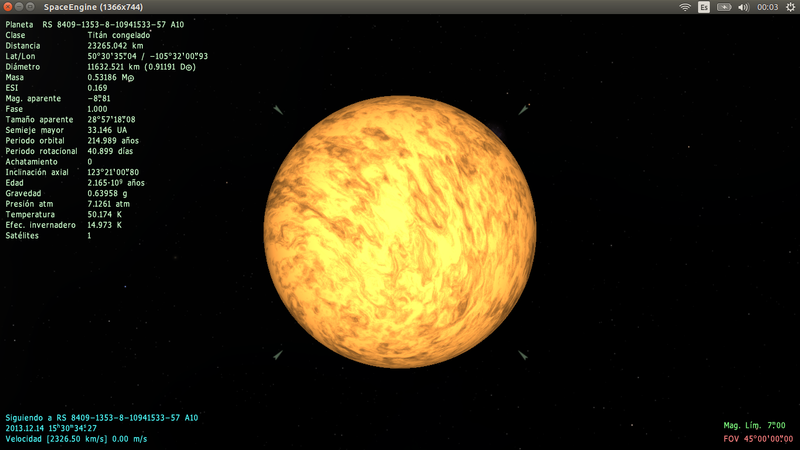 Download your favourite Space Engine version and install it. No changes are needed. 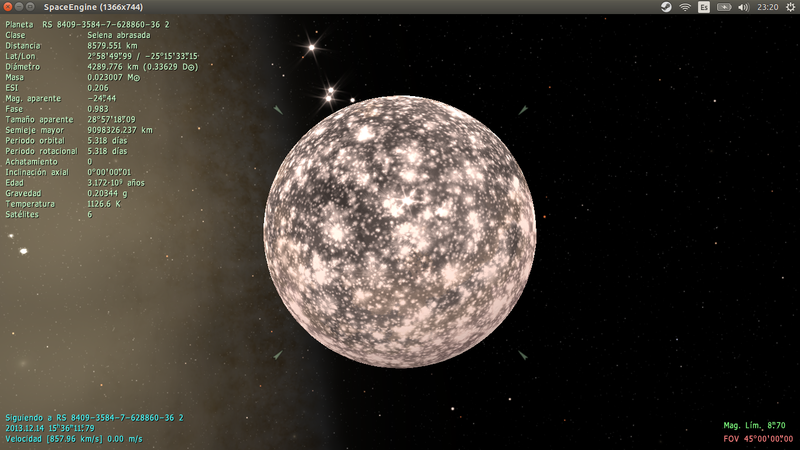 The FPS are the same both in Windows and Linux. You won't have worse performance if you follow this tutorial. Here you have screenshots of my laptop, my graphic card only goes up to OpenGL 3.0 so some features doesn't work fine for me (antialiasing, atmosphere...). That's not Linux fault, it's just my own graphic card, so don't worry. If you reach the requirements everything will work fine. 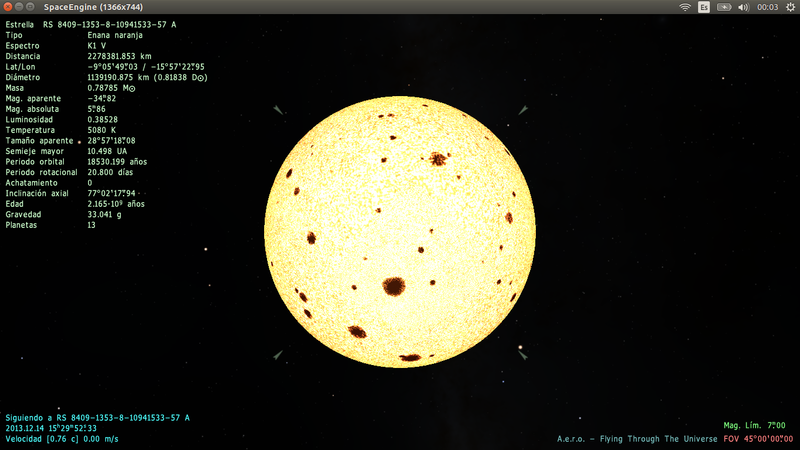 In my laptop with Xubuntu 14.04 with an Nvidia Optimus configuration, Space Engine 0.9.7.4 RC1 runs with latest Wine with black screen, using integrated Intel graphics chipset. Since it works flawlessly on Windows 10 it should work on Linux I guess, unfortunately I haven't been able to switch on the Nvidia 940M yet, tried bumblebee a bit but I've been very lazy recently, that comes with these cozy distributions .